I decided to post deck lists for a few of my Magic: the Gathering decks I have constructed. This one is named Draconic Shadows and is a casual Vintage format deck. The mana base was a sort-of personal project. The Badlands were not cheap. There are no basic lands, and nearly every land can produce both black and red mana. This is my favorite deck (not really my best, though), so it got special treatment in the land department. 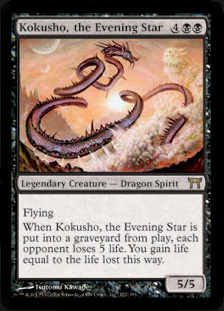 The main strategy is to use Kokusho, the Evening Star to win by attacking with it and/or killing it. Due to the legend rule, if I play another one they both die. Most of the other cards in the deck either help me get it out or stall the game until I do. I use Makeshift Mannequin to reanimate them. Perhaps the card that describes best the way the deck plays is No Mercy. If you have suggestions, feel free to leave a comment. EDIT: In: 4x Makeshift Mannequin; Out: 3x Beacon of Unrest, 1x Infernal Tutor. The decklist above reflects these changes. Makeshift Mannequin might be better than unrest. It is one mana cheaper and has a pretty good ability that adds more synergy to your deck. I was using Beacon of Unrest because I could re-use it and steal things from my opponent. But I usually used it on the dragon anyway. Believe me, I've had about everything you can imagine happen to that dragon. Removed from the game, taken control of, Humbled (then killed)... This will be excellent insurance against that sort of stuff. Thanks for pointing that out.